Next week's total lunar eclipse may thrill millions of skywatchers, but it poses a bit of a challenge for a sharp-eyed NASA moon probe. The batteries that power NASA's Lunar Reconnaissance Orbiter (LRO) need sunlight to recharge, and the spacecraft will fly in darkness for an extended period of time during the total lunar eclipse, which will be visible throughout the Western Hemisphere overnight on April 14 and 15. LRO should make it through the eclipse just fine, Petro added. "For quite a while, people in LRO have been analyzing what's going to happen during this eclipse," he said. "We'll make sure the world knows LRO survived with no problems." The particular celestial geometry of next week's eclipse forced the LRO team to tread carefully. The spacecraft has zipped through other eclipses with its eyes wide open, because it was confined to Earth's shadow for just a short amount of time, NASA officials said. Indeed, eclipses sometimes open windows of scientific opportunity for the LRO mission, researchers said. For example, the probe can measure how the moon cools during such events, yielding clues about the composition of the lunar surface. For viewers in the Western Hemisphere, the upcoming eclipse will officially begin at 12:53 a.m. EDT (0453 GMT) on April 15. The eclipse will achieve "totality," when all of the moon is plunged into Earth's shadow, at 3:06 a.m. EDT (0706 GMT). This most dramatic phase will end at 4:24 a.m. EDT (0824 GMT), and the eclipse will be over by 5:33 a.m. (0933 GMT). Next week's eclipse is the first of four total lunar eclipses that will grace Earth's skies in roughly six-month increments over the next 18 months. The other eclipses in this "tetrad" occur on Oct. 8 of this year and April 4 and Sept. 28, 2015. 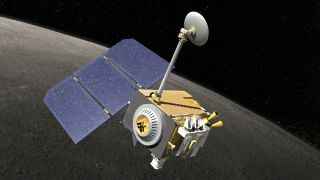 The $504 million Lunar Reconnaissance Orbiter mission launched in June 2009 to map the moon in unprecedented detail. The probe is about the size of a small car and sports seven different science instruments.